Happy New Year, hope you had a fun and safe New Year's Eve! For my first card of 2017, I have a birthday card made with the Funky Cornflower from I Brake For Stamps. It was stamped with Onyx Black Versa Fine ink and embossed with clear powder. Then it was colored with Zig Clean Color Real Brush Pens and cut out. Decorative yellow paper was layered onto a larger black panel and set aside. 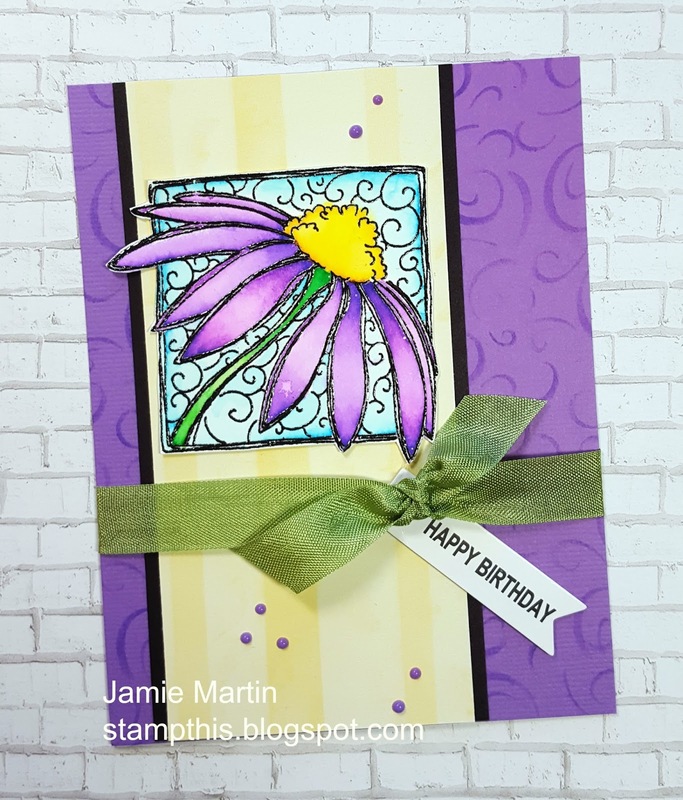 I just happen to have a stencil that matched the swirl background of the flower perfectly. The stencil was laid on a purple top folding card and stippled with Wilted Violet Distress Ink. All of the pieces were glued onto the card as shown. The card was then tied with green ribbon, the Happy Birthday banner was glued under the ribbon and Crushed Grape Nuvo Crystal Drops were added. Very pretty, Jamie! Happy New Year!